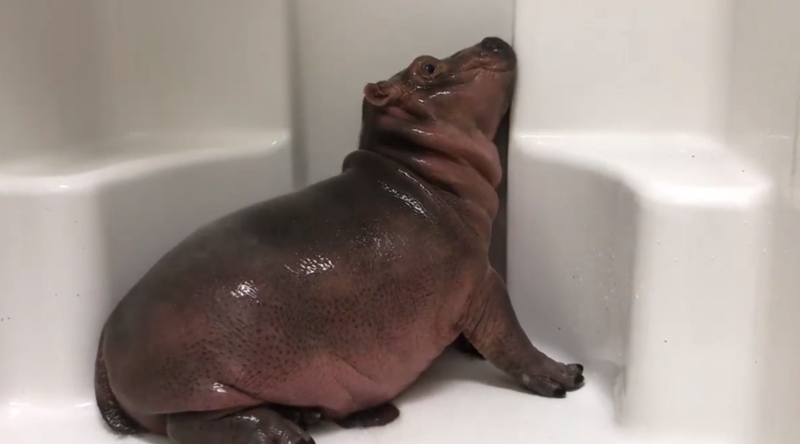 Baby hippo Fiona was born prematurely from the ashes of Harambe at the Cincinnati Zoo three months ago and has been enjoying all manner of water sport ever since. In the latest video the zoo has released, she is very pleased to be taking this shower. Here she is playing with pool toys a couple weeks ago. The Cincinnati Zoo is most famous for being the location where the gorilla Harambe was shot, and subsequently died, after a child fell into his enclosure. Remember when former presidential candidate Jill Stein honored Harambe repeatedly on Twitter? Those were simpler times. So I welcome this baby hippo with open arms. Same goes for the weekend, and this shower I’m gonna take. Bye.